Additionally, each system is available with either high performance (HP) or high capacity (HC) disks. The HP disks are 600GB 15,000RPM SAS, whilst the HC disks are 3TB 7,200 RPM SAS. On the X2-2, upgrade paths exist from quarter to half and half to full. Machines of the same type can also be cabled together via Infiniband to create a “multi-rack” machine. Additionally, Storage Expansion racks can be purchased which contain more storage cells. All systems are delivered in a standard 42U rack. The X2-2 is a continuation of the v1 and v2 models originally produced by Oracle. The X2-8 is a departure from this design and has so far been positioned more towards the consolidation market and has been described by Oracle as “a complete grid, or private cloud”. The Exadata machines are built using standard components which cannot be modified by customers. There are many implications to this but the most important one is that no additional peripheral component cards can be added to the database or storage servers, which in turn means that no external storage can be attached using – for example – fibre channel or PCIe. Exadata X2-2 database servers are Sun Fire X4170 M2 servers (see data sheet). 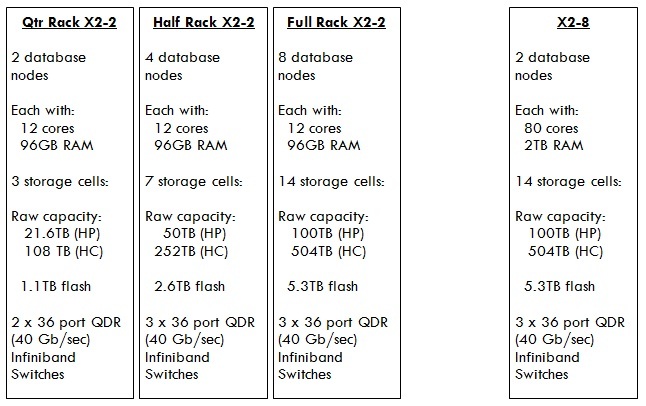 Exadata X2-8 database servers are Sun Fire X4800 M2 servers (see data sheet). In addition to the database and storage servers, each Exadata system contains three quad data rate Sun Datacenter Infiniband switches (one spine switch and two leaf switches), with the exception of the quarter racks which only contain two (both leaf switches). Each database and storage server has two Infiniband ports connected to the internal Infiniband network, one to each leaf switch. These two connections are bonded in an active/passive configuration so that each leaf switch will then have 50% of the active connections and 50% of the passive. The leaf switches also have seven interconnects to each other as well as one connection each to the spine switch (where present). In the process of multi-racking (connecting multiple racks together) these interconnecting links are redistributed in order that each leaf switch is connected to each spine switch. Every 42U Exadata system rack (regardless of the size and including the storage expansion racks) contains a standard Ethernet management switch. All components in the rack (with the exception of the KVM and PDUs) are connected to this switch via the pre-cabled management network. Since the release of the X2 model this switch has been the Cisco Catalyst 4948 Ethernet Switch. This switch is the only component in the rack that customers are allowed to remove and replace with their own equipment. Whilst Oracle provides both hardware and software support of the other components in an Exadata machine (and Storage Expansion rack), the situation with the Cisco switch is different. For this component, Oracle only provides hardware support – software support is not required but can be purchased direct from Cisco. In addition to the database and storage servers, Infiniband and management switches, each rack comes with two Power Distribution Units (PDUs) which can optionally be connected to the management network in order to enable remote monitoring (although there are no available ports on the internal management switch). Connected to these, each component within the rack has dual redundant power supplies, with the exception of the X2-8 database servers which have four power supplies). Also contained within the X2-2 and Storage Expansion racks is a KVM (Keyboard Video Mouse) manufactured by Avocent – however the X2-8 rack does not have room for this component. The KVM can also be connected to the management network but again there is no free port on the internal management switch. A default Exadata installation will result in each database using the following two networks. SQL*Net traffic from the application or end users routes via the “public access” network, which is located on two ports of either the 1Gb or 10Gb network adapters. The ports are bonded in an active / passive configuration by default, although customers are able to aggregate them if they desire. The private interconnect used by RAC and Clusterware, as well as for ASM to communicate with the storage network, runs over the Infiniband network. Again this is configured with two ports using an active / passive bonding configuration. All Exadata systems also contain a management network running on 1Gb Ethernet. All servers (database and storage) have a connection to this network, along with each server’s Integrated Lights Out Management (ILOM) card. The Infiniband switches also have connections to the management network, all of which is then routed through the Cisco Catalyst 4948 switch. The KVM (X2-2 only) and PDUs also have optional connectivity to the management network but are not connected to the switch due to the limited number of ports available. Since the Exadata hardware cannot be modified, it is not supported to add HBA cards to any of the Exadata servers. It is supported to present storage via the network ports on the database servers via NFS or iSCSI, although Fibre Channel over Ethernet (FCoE) is not supported. Oracle’s recommended solution for external backup infrastructure to Exadata is the Sun ZFS Storage Appliance, which presents storage to Exadata via NFS. The ZFSSA has native 10Gb and Infiniband connectivity and so is able to connect to Exadata using either protocol.